We invite you to join us for a very special Food for Thought "Meet and Eat"! Participate in a hands-on cooking demonstration with Chef Iris from "It's Kosher Catering". 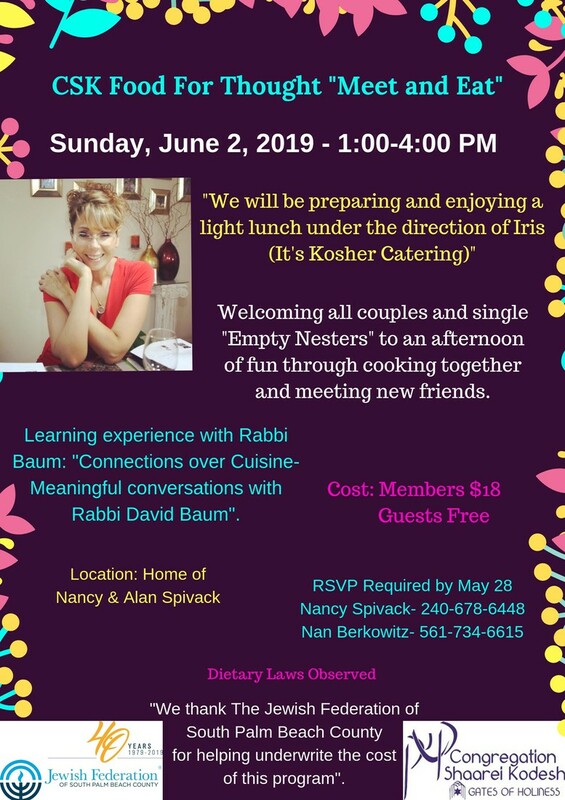 Learning experience with Rabbi David Baum: "Connections over cuisine- Meaningful conversations with Rabbi David Baum". The cost to members is $18 per person. We encourage you to bring friends! Guests are FREE but registration is required. We kindly ask that you RSVP by Tuesday, May 28, 2019. CLICK TO REGISTER FOR FOOD FOR THOUGHT "Meet and Eat"!